Happy New Year, dear reader! 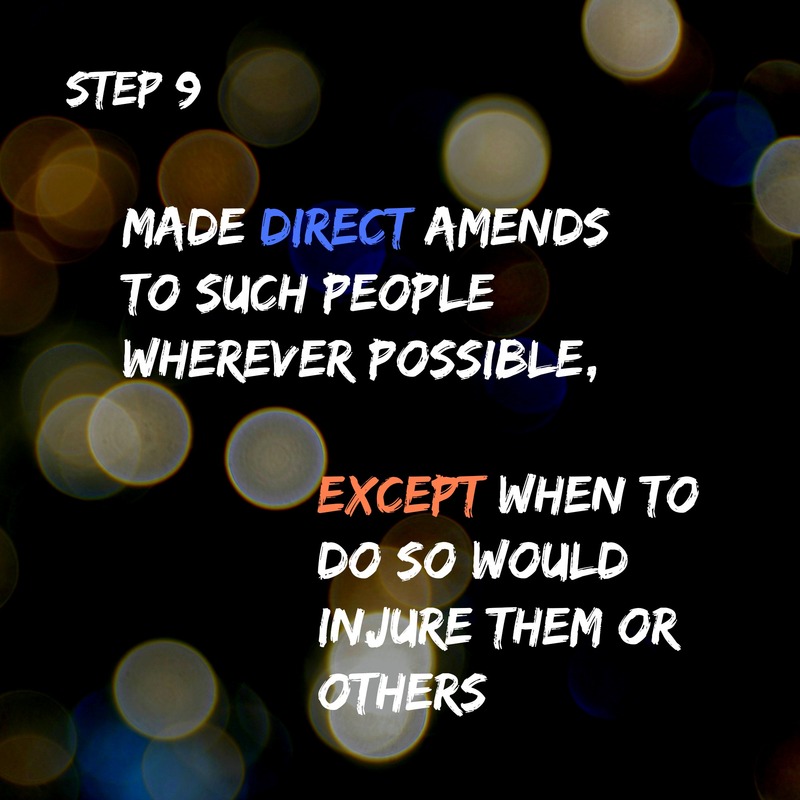 New Years Day is perfect for starting fresh, perfect for beginning to make our Step 9 amends. As we think of the list we made in Step 8 and begin to ask God how to go about making amends with those we’ve harmed in our struggle to control our own out of control lives, we may begin to feel overwhelmed. We may have a mountain of amends looming before us. The enemy of our souls will attempt to heap fear, guilt, or shame on us as we prepare to contact those we’ve harmed. We do not need to accept his lies. With each new morning, God’s “mercy,” “loving-kindness,” and “tender compassions” (see the Amplified Bible) are fresh for each of us. We never have to wallow in yesteryear with God. He does not hold shame over our heads, waiting to douse us in a fresh dose whenever we mess up. God accepts our humble acknowledgement and confession of sin. He moves us forward each day with fresh mercy. I wish I could say the same for the humans we deal with. Unfortunately, they are a mixed bag. Sometimes we will find mercy and compassion as we navigate Step 9. Sometimes we will run headlong into someone else’s unhealthy rage, retaliation, or indifference. When I took Step 9 again a few months ago, I experienced a not-so-great response from someone I reached out to. She wasn’t unkind, but her words stung like a slap in the face. It had been more than seven years since my actions had hurt her. She seemed shocked that I would reach so far back to make amends. Then she basically told me that she had forgiven me because that’s what God commands. She said she would say it to me if that’s what I needed to hear from her to make myself feel better. Ouch. Yeah, that’s what can happen when you reach out to make amends. But you know what? It’s okay. I had deeply wronged her and I needed to let her know that I knew I had and that I am sorry. However she responded was her choice. I’m not sure I would be very gracious, either – to someone who had done to her what I had done. Sometimes we just have to move forward, doing our part and releasing all of the persons we’ve hurt, to our God, who IS merciful, gracious and understanding of why we acted how we acted in our wounded and/or addicted state. As we welcome 2015 today, let’s move into it with open hearts, open minds, and courage to make our amends. If you have any amends stories of your own, please feel free to share them in the comments section, or even email me with them at info@julietvanheerden.com. I would love to hear from you and share your stories with others.